Home » The Case for Jamie Official Preorder! 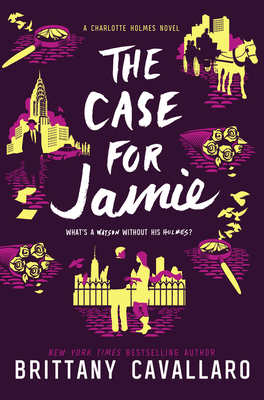 The Case for Jamie Official Preorder! On Shelves March 6th, 2018—Preorder Now! Charlotte and Jamie are back in the third Charlotte Holmes novel! It's been a year since the shocking death of August Moriarty, and Jamie and Charlotte haven't spoken. Holmes and Watson may not be looking to reconcile, but when strange things start happening, it's clear that someone wants the team back together. Someone who has been quietly observing them both. Making plans. Biding their time. Be among the first to find out what happens! Preorder your copy of The Case for Jamie. Each preordered book will be signed in person by the author--no autographed stickers here!--and will ship with exclusive Charlotte Holmes swag. Order more than one, or get a copy of either of the first two Charlotte Holmes books, and we'll also include bookplates for your extra copies! Please note that all copies of The Case for Jamie ordered before March 6th, 2018, are eligible for signed copies and preorder special items, but that those ordered after March 3rd may be subject to additional wait times. Don't delay: order your copy now!